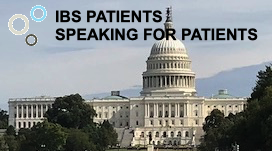 Jeffrey Roberts and the IBS Patient Support Group have provided in-person testimony to the U.S. Food and Drug Administration (FDA). The IBS Patient Support Group has shared the perspective of Irritable Bowel Syndrome (IBS) and other functional GI and motility disorder (FGID) patients with several FDA committees. We bring the patient perspective to committees in the regulatory decision making process so that they can be directly informed as to how decisions affect patients. On February 1, 2019, Jeffrey Roberts, Founder IBS Patient Support Group, commented to the FDA in connection with the Citizen Petition for Zelnorm (tegaserod) submitted by Hyman, Phelps & McNamara, P.C. on November 21, 2018 for Irritable Bowel Syndrome with constipation (IBS-C). Read the comment here. On October 18, 2018, Jeffrey Roberts, Founder IBS Patient Support Group, provided in-person testimony to the FDA in connection with a meeting of the FDA Gastrointestinal Drugs Advisory Committee to discuss approval of Prucalopride for Chronic Idiopathic Constipation (CIC). Read the testimony here. On October 17, 2018, Jeffrey Roberts, Founder IBS Patient Support Group, provided in-person testimony to the FDA in connection with a meeting of the FDA Gastrointestinal Drugs Advisory Committee to discuss the reintroduction of Zelnorm (tegaserod) for Irritable Bowel Syndrome with constipation (IBS-C). Read the testimony here and the slides here. On July 14, 2004, Jeffrey Roberts, provided in-person testimony to the FDA in connection with a meeting of the FDA Gastrointestinal Drugs Advisory Committee to discuss the additional indication of Chronic Idiopathic Constipation (CIC) for Zelnorm (tegaserod). Read the testimony here and the slides here. On April 23, 2002, Jeffrey Roberts, provided in-person testimony to the FDA in connection with a meeting of the FDA Gastrointestinal Drugs Advisory Committee to discuss the risk management and the reintroduction of Lotronex (alosetron) for Irritable Bowel Syndrome with diarrhea (IBS-D). Read the testimony here and the slides here.